It’s becoming more and more common to hear both researchers and policymakers across the OECD talking about the polarisation of labour markets. This is the idea that, because of technical progress, many middle-skill, middle-wage jobs (such as assembly line operators and clerical workers) have been replaced by machinery, hollowing out the labour market. This leads to increased employment in either high skill jobs – managers, professional and technician – or low wage work, particular in personal or retail services. This pattern of change has been particularly noted in the US (through the work of David Autor and colleagues) and the UK (most prominently in the work by Alan Manning and Maarten Goos). There is growing evidence of this phenomena occurring, to a greater or less extent, across Europe as well. While we readily see this change in the types of jobs people are doing, it is less clear what effect this had had on the distribution of earnings. If everything else in the labour market had stayed the same, this hollowing-out would certainly be the cause of rising wage inequality. However, over the past thirty years, polarisation is just one of a number of changes which have impacted what people are paid. So the question is: what impact has it really had on earnings? In a new report for the Resolution Foundation, Professor Ken Mayhew and I look at this question in the UK. We find that, when looking at wage distributions from the mid-1980s until the early 2000s, there is a surprising lack of evidence that work is polarising into high paid and low paid jobs. Certainly, there has been an increase in the gap between low and middle earners which means that if the definition of a low-paid job is some proportion of the median wage, then the share of workers in this part of the distribution has increased. Similarly, the share of workers in jobs earning multiples of median earnings has also increased as wage growth at the top outstrips that at the middle. However, there is a more interesting picture of how pay has changed if we consider the range of wages being paid as a scale along which all jobs are placed. In that case, whether we think of a job as good or not depends on its placement on this scale. In particular, the very rapid growth in wages for the top 10-15% of workers that has seen them pull away from the rest has meant that the majority of jobs earning above median wages more closely resemble middle wage jobs, rather than top jobs. What accounts for these changes? The report breaks down the changing shape of the wage distribution into the individual contributions from a wide range of factors that are related to earnings. An increase in educational attainment, particularly through a growth in the number of graduates, has pushed all wages upwards, but this effect is largest at the top of the distribution. Similarly, the decline in union membership has pulled wages down, but this effect is larger at the bottom and middle of the distribution. By comparison, the hollowing out of certain types of jobs has had a smaller effect – not as large (and positive) at the top, or as large (and negative) at the bottom as the changes caused by these other two factors. The second thing that has changed is the way different worker characteristics correspond to wages – what economists call rates of returns or wage premia. The wage differentials between different occupations have changed, but these changes are not the same across the distribution. The relative earnings of managerial workers, for example, have grown particularly around the 75th percentile of the distribution, but much less elsewhere. Rates of return to a degree also appear to have fluctuated at different points in the wage distribution. Our analysis shows that the graduate premium has grown sharply for the top 15% of earners, but has remained relatively constant (or even declined) for everyone else. The overall result is that the growing group of the apparently good, high skill jobs are becoming increasingly heterogeneous in their earnings, with many of them simply replacing the old middle skill jobs in the earnings distribution. To illustrate this further, consider the gross weekly earnings of managers in three different industries: healthcare, retail and financial services. According to the polarisation concept, the growth of theses job, with their higher average earnings, should have increased high wage employment and driven up earnings inequality. However, while many of the new managerial jobs created in healthcare continue to exhibit high earnings, those created in retail are increasingly much lower paid. Between 2000 and 2008, the proportion of these jobs earning below £400 per week – adjusting for inflation – increased from 37% to 58%. In financial services, a sector which has performed relatively well over this time period, there has clearly been a growth in high wage managerial jobs. Jobs earning over £1,500 per week increased from just a couple of percent in 1993 and 2000, to 10% in 2008. 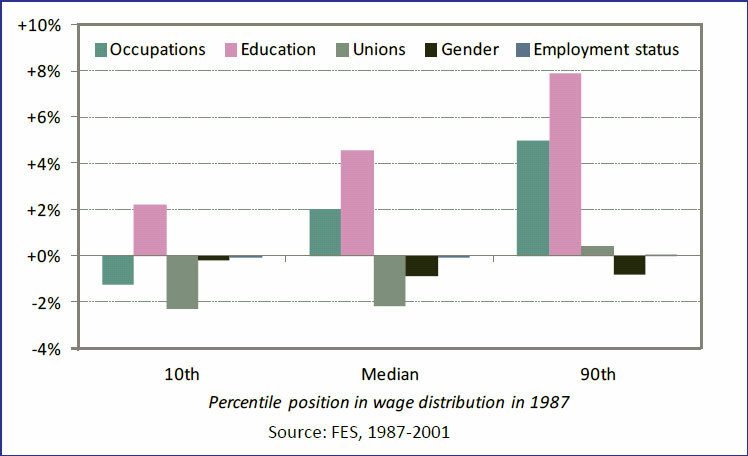 However, there was also a growth in the proportion of managers in this sector earning less than £400 (from 24% to 30%). Perhaps this should not be surprising – why should someone moving from a middle-wage, routine job to a managerial or technician occupation be as likely to earn as much as someone who had previously self-selected into those occupations? Their capacity to do a job through formal education and training and differences in unobservable abilities are an important contributor to eventual earnings. Two major implications come from this report. First, the findings suggest an important constraint on the belief that technological progress will continue to create good, high-skill jobs for an increasingly well-educated workforce. The lower-than-expected pay for many of these workers is related to their value-added and their productivity, suggesting either a shortage of specific skills in new hires or a significant underutilisation of these skills by employers creating and designing these jobs. Second, these conclusions are also relevant to the growing concern that median incomes are stagnating, relative to growth (as highlighted by the Resolution Foundation’s report last year). In the past, the polarisation notion has been used to attempt to explain this, with increasing wages for higher end jobs, and decreasing wages for the declining middle jobs. Our research frames the argument differently. As around 44% of jobs would be classified as higher end jobs, the median worker is now quite likely to be working in one as well. Therefore, it is the growing disparity within this one group of occupations, rather than the widening of earnings between the two groups of occupations, that may offer a better explanation of the phenomenon. The OECD’s Going for Growth 2012 has a chapter on Reducing income inequality while boosting economic growth: Can it be done?